Send Joshua Project your updates! Afghanistan boasts the largest Tajik population outside their homeland to the north in Tajikistan. Comprising over one-quarter of the Afghan population, they are the second largest group in the country. Dating from the 4th century, historical evidence strongly supports their being one of the most ancient of the surviving Central Asian people groups. A Mediterranean sub-group of the Caucasian race, modern Tajiks are descended from Persian peoples. A tall, slender, fair-skinned people with blue or green eyes and often with red or blond hair, intermarriage with Turks and Mongolians introduced almond-shaped eyes and straight black hair to their physical characteristics. An old Turkish expression, "Tajik" is synonymous with "Persian". They have always spoken Persian (speaking the related Dari dialect in Afghanistan) whereas other Persian language speakers in Central Asia adopted the language. Most often they refer to themselves by the valley name of their home region rather than as Tajik. One vast habitat is the rugged, mountainous Panjsher Valley north of Kabul where poor farmers and herders live in villages of flat-roofed mud brick or stone houses. When water is plentiful the country's finest fruits and nuts, as well as various grain crops, are produced here. Ahmad Shah Masoud, Afghanistan's revered Taliban resistance leader who was assassinated in 2001, was a native son of this valley. Smaller concentrations of Tajiks live in Herat Province on the western border with Iran. A third group, large and more educated, lives in Kabul where they have enjoyed economic success and political influence. Merchants and highly talented craftsmen are also a segment of these urban dwellers. Because large Tajik families are close-knit, city-dwellers are known to maintain close ties with their relatives in the countryside. Originally a tribal group, they abandoned strict organizational structure long ago. However, cultural traditions are guarded and observed - traditions that survived centuries of invasion by forces ranging from ancient Arab hordes to recent Taliban fighters. One social tradition is that of offering extraordinary hospitality - a practice shared with other Afghan peoples. Hosting guests is considered an honor - an occasion for a fine meal. "Osh", a special dish prepared by Tajik men, contains rice, lamb, spices and vegetables and may be served with flat bread rounds baked with a blend of several flours, fruit, yogurt and tea. Even poor farmers welcome guests with tea, bread and yogurt. Forcefully converted to Islam by Arabs in the 7th century, Afghan Tajiks remain almost entirely Muslim. Religious traditions dictate rituals to celebrate important life passages, including birth, marriage and death. Memorized prayers are recited daily and in some communities old practices incorporating magic, charms and animistic beliefs still have a place. Time-honored artistic traditions including poetry, folk tales, artwork, songs and dances define and preserve the values of the Tajik culture. Creative expressions include handsome carpets, ceramics, richly embroidered costumes and men's brightly colored caps and jewelry. In times past, Tajiks painted elaborate wooden ceilings in mosques and palaces and decorated books, often incorporating Persian poetry in both. Afghan Tajik clothing is not especially distinctive but men do top their embroidered caps with a Turban and women favor shawls over veils. Tajik society is male dominated, but women have known less public restriction in the workplace and society (except under Taliban rule) than women in other Muslim groups. Their private lives are similar, however, leaning to the man's advantage. Women have no rights of inheritance. Afghan marriages are typically arranged and divorce may be initiated only by a husband who dissolves a union by repeating three times to his wife, "I divorce you". Past advantages the Tajik enjoyed in Afghan society may have eroded somewhat amid the instability of recent years. However, a strong national identity and their characteristic hard work will doubtless serve Tajik community members well as Afghanistan rebuilds. The Tajiks are almost entirely Muslim. Most of them are Sunni Muslims of the Hanafi Sect, but there are a few Ismaili Shia Muslims living in the remote mountain areas. Islam permeates every area of their lives. Rituals relating to birth, puberty, marriage, and death are all built around their beliefs. They faithfully repeat memorized prayers five times a day. In addition to Islamic beliefs, spiritism (beliefs that incorporate use of charms and amulets) is also widespread among the Tajiks. The Tajiks have known frequent war and internal tribal strife. Their territories have continually been invaded over the centuries by Arabians, Greeks, Mongolians, Persians, Turks, Russians, and the British. The Islamic religion is very difficult to influence. Converts to Christianity will more than likely be "banished" from their families. Because of this the Tajiks, though usually warm and hospitable, are becoming more and more apprehensive towards outsiders. The Tajiks speak Dari Persian, a language that came from King Darius (mentioned in the book of Daniel). Unfortunately, only about one-tenth of the Tajiks are able to read. * Ask God to restore political peace and stability to Afghanistan. * Ask God to call Christian workers who are trained in the Dari language to take the Gospel to the Tajiks. * Pray that the Christian relief workers who are working in Pakistan will be effective witnesses among the Tajiks who have been displaced from their homes. * Pray that relief funds will be made available for those living in famine stricken areas. 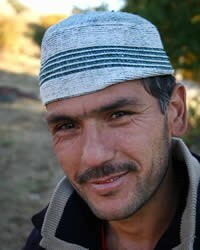 * Pray that strong local churches will be planted among the Afghani Tajik.